Good morning, dear tea friends! We’ve entered the month when spring arrives and begins to soften the air with her gentle touch. The snow is starting to melt, the days are expanding with light and there’s hope in the air after a long, hard winter here in New England. 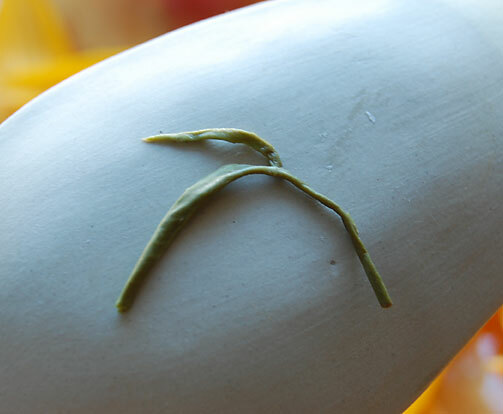 The first lots of first flush Darjeelings over in northeast India are beginning to be plucked and processed. There’s much to look forward to. In celebration of the beginning of the Darjeeling season, a second flush Darjeeling from the Thurbo Estate graces my cup this morning. This tea was harvested in the summer of 2013 on the Thurbo estate, which is located in the Mirik valley in Darjeeling district. I’ve read that this tea estate got its name because the British set up camp there long ago to invade Nepal, which is close by. The local dialect word for “camp” is “tombu” which could have morphed into Thurbo. An interesting little bit of trivia. The leaf is a gorgeous variegated mix of color – browns, greens and silvery white tips. I pushed the steeping time a little longer than normal, 3 1/2 minutes in boiling point (212F) water. 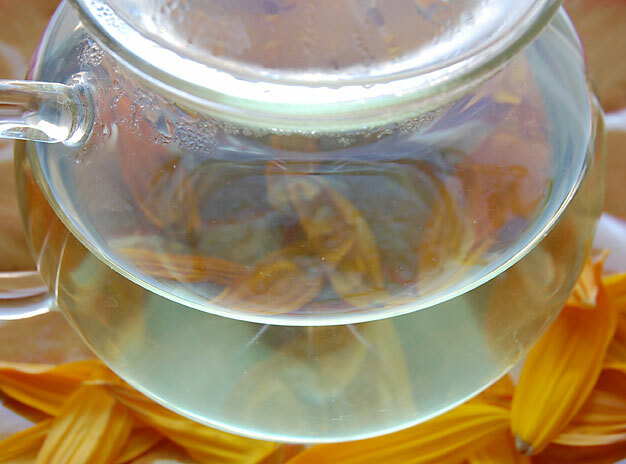 The vibrant amber-colored tea liquor has a light, fruity fragrance. The flavor is rich with light fruity nuances of pineapple and a tang reminiscent of fresh evergreen/pine. The lingering finish invites you to take another sip of this lovely tea. I sit and quietly sip my tea, dreaming of the day not that far away when little green leaves start to emerge from the soil after their long winter’s sleep. I can’t wait to get my hands back into gardening! Thanks for sharing another cuppa with me. Until we meet again, have a wonderful two weeks! Good morning, dear tea friends! This frigid day is wrapped in pale gray clouds, seeming to hold its breath waiting for the first snowflakes to start drifting down this afternoon. Yes, we are getting our first snowstorm of the season, and that calls for a tea to warm my bones. 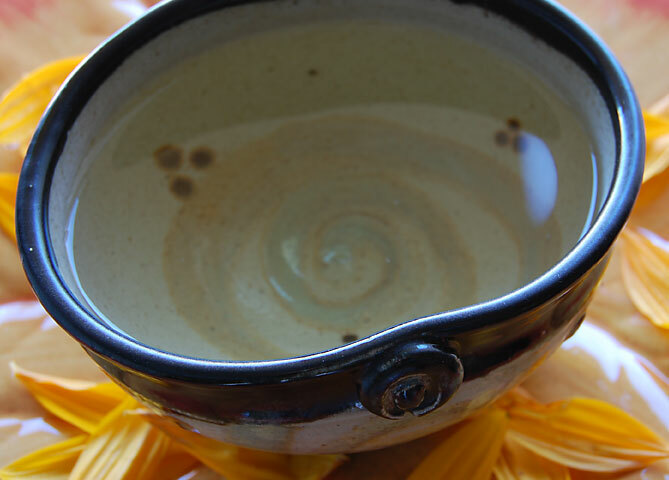 Filling my cup this morning is a tea from China with deep, rich warming flavor, called Sweet Honey Black Tea. During processing, the leaf was rolled like an accordion, giving it a look like long wisps of crepe paper. Some of the wisps opened during the 5-minute steep in boiling point (212F) water but most retained their pleated shape. A warm, cocoa aroma wafted up from my glass teapot as I poured my first cup. My bones felt comforted already. This tea is well named as the deep amber liquor has pronounced notes of honey. Mingled with this lovely sweetness are notes of chocolate and a deep Burgundy nuance, likening its character to a Keemun tea. I could drink this tea all day long, wrapped in a blanket, watching the snow fall. I settle down to sweet strains of Celtic Christmas music playing on my Bose Wave and pick up my wooden pointy sticks to work on a knitted gift. Good morning, dear tea friends! I know that I’ve been sharing a lot of first flush tea selections with you lately but I couldn’t resist just one more. This is a special lot, the leaves plucked at sunrise for optimum flavor retention, called Victoria’s Peak Sunrise First Flush Clonal Darjeeling. The leaf is quite large, with a goodly number of downy tips. I steeped it for 4 minutes in 190 F water. Why the lower water temperature, you might ask? The leaf was harvested quite early in the season and with all of the new “greeny” growth, I decided to cool the water for steeping. 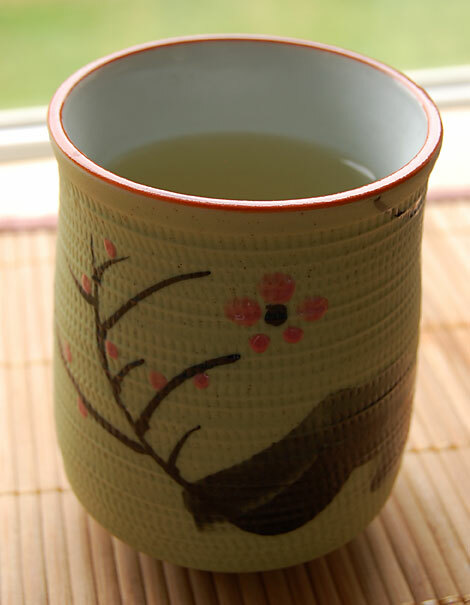 Since I cooled the water and also knowing that this tea was quite smooth and light, I increased the steeping time. I’m going to try 5 minutes next time and see what happens. I have so much fun experimenting! Here’s some information about Victoria”s Peak from the grower. It sounds like a beautiful area. The light golden tea liquor had a pronounced vegetal aroma when I first removed the infuser from my glass teapot. This vegetal quality dissipated rather quickly to reveal a sweet floral fragrance, which I found quite appealing. The flavor is silky smooth and light, very fresh, with pronounced floral notes and a hint of sweetness that reminds me of a ripe pear. Yum! The month of May is blessing us with warmer weather so I was able to throw open all of my windows and breathe in the fresh scent of flowers from my garden. As I gaze out my window now, I watch windswept gray clouds racing across the sky heralding a bit of stormy weather headed our way. The faint rumble of thunder rolls across the darkening sky, confirming my thoughts. Well, I guess I won’t be gardening this afternoon. Time to brew up another pot of this lovely tea and sit with my latest beading project, a freeform cuff that just keeps on growing. I’ll be happy to share it with you once it’s all finished. Good morning, dear tea friends! As I write this, I’m joyfully listening to James Taylor sing “Here Comes the Sun”. Here in the northern hemisphere, the sun has returned and the days will get longer now with the arrival of the Winter Solstice yesterday. The light of the holiday season is upon us. On this blustery, early winter morning, I’ve brewed up an unusual cup of tea. Well, unusual for me. 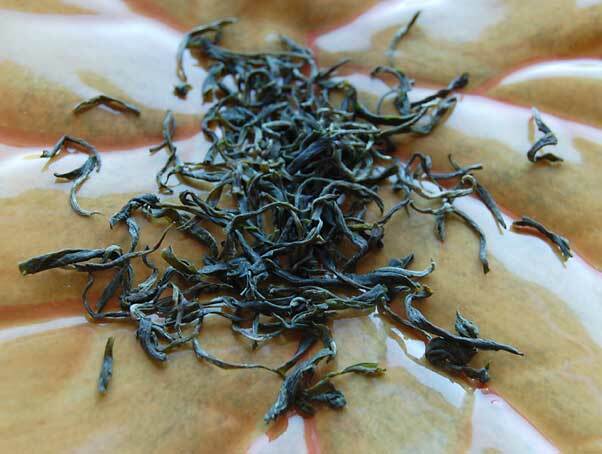 A China black tea that has been smoked over pine root fires. Can you guess what it is? If you guessed Lapsang Souchong, you are absolutely correct. To be honest, I’m not partial to the extreme smokiness of this tea, a flavor that tastes of burning pine. Lapsang Souchong tea, grown in the Wuyi region of the Fujian province of China, is known for its distinctly very smoky aroma and taste. During its processing, the leaves are dried over pinewood/root fires, which impart that smoky quality to the leaf. In essence, the leaves are “smoked’ in their drying. The story goes that many years ago the tea processing had to be sped up as armies marched through that region so the villagers dried the tea leaves over open pinewood fires. A new type of tea was born. I often thought that Lapsang Souchong leaf was very big but this leaf doesn’t appear so. The leaves used for this tea are found lower down on the tea plant and, since most of the caffeine is concentrated in the new growth, the caffeine content of this tea is found to be lower than usual. I steeped the leaves for 4 minutes in boiling point (212F) water. An interesting thing occurred as I poured the water over the leaf in my glass teapot. It started smoking quite a bit. At first I thought it was due to the water being very hot but the tea liquor was smoking like crazy as I pulled out the infuser basket 4 minutes later. Has that happened to anyone else? The aroma is quite strong – a piney, smoky, campfire smell. The amber-colored tea liquor is quite sweet and smooth with, of course, the predominant smoky flavor. As the tea cooled, the flavor became sweeter and less smoky. That said, the smoky flavor lingered in my mouth for quite a long time and, despite all that smokiness, I found myself beginning to enjoy the tea. I’m very proud and happy to share that two of my very dear art friends are teaching classes in the new year. My friend, Amy Crawley, is a polymer clay artist who creates the most wonderful and whimsical sculptures. She’s teaching a class called “Polymer Clay Boot Camp”. If you live in the Concord, MA area and are interested in learning all about polymer clay, you may read all about it here. My friend, Judy Shea is a mixed media artist extraordinaire, best known for her colorful and innovative canvas pieces, incorporating paint, stencils, stamps, mixed media components and polymer clay. She’s teaching online at Joggles and you may read all about it here. I’m heading out to visit family in Michigan for the holidays so my tea posts will return in 2 weeks time. 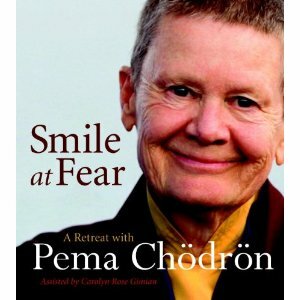 I look forward to sharing another cup of tea with you then. I wish you and yours all the peace and joy of this magical season! Good morning, dear tea friends! My morning tea is an Assam from the Mangalam estate, however, after I took all of my photos and inserted the card into my computer, it couldn’t read the card! Oh dear. When I inserted it back into my camera, it said that the card was damaged. So, change of plans this morning. One of my favorite herbal teas is Ginger Root so I’ll rerun my review of it. I’ll be back as soon as I get a new card for my camera. Enjoy! My morning tea today is not a tea at all but an herbal which has a long history of many uses worldwide: culinary, medicinal and as a delicacy. 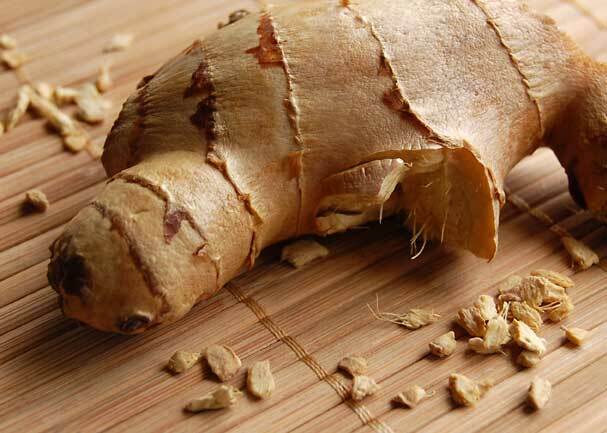 The dried root of the ginger plant also makes a wonderfully spicy beverage when infused! 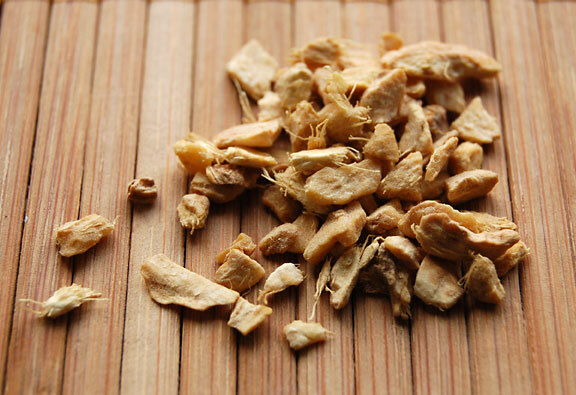 Technically known as the rhizome of the ginger plant, Zingiber officinale, this was grown in the Jinxuan Province of China. Ginger cultivation began in China and Southeast Asia and then spread to other parts of the world such as the Caribbean and Africa. 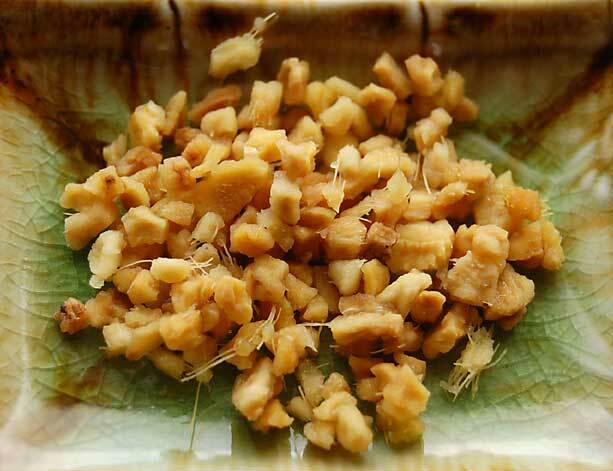 Its characteristic odor and taste comes from the volatile oils found in the root. I steeped the ginger pieces for 8 minutes in boiling water. 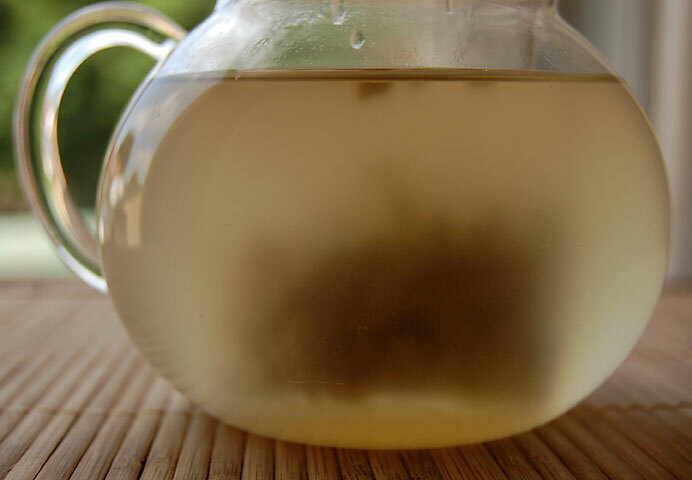 As it brewed, the water became cloudy, giving my glass teapot a mysterious, underwater appearance. The aroma of the infused “tea” is fresh and spicy. Sometimes, herbals can be confused with real tea which comes from the camellia sinensis plant. 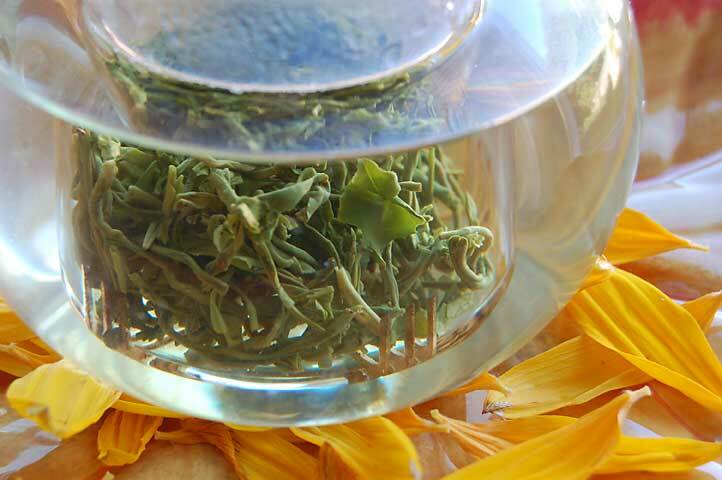 Just like tea, each herbal comes from its own specific plant. Almost all herbals, not tea, are caffeine free. The frosty, lemon-colored liquor tastes quite zesty with tart notes of lemon. 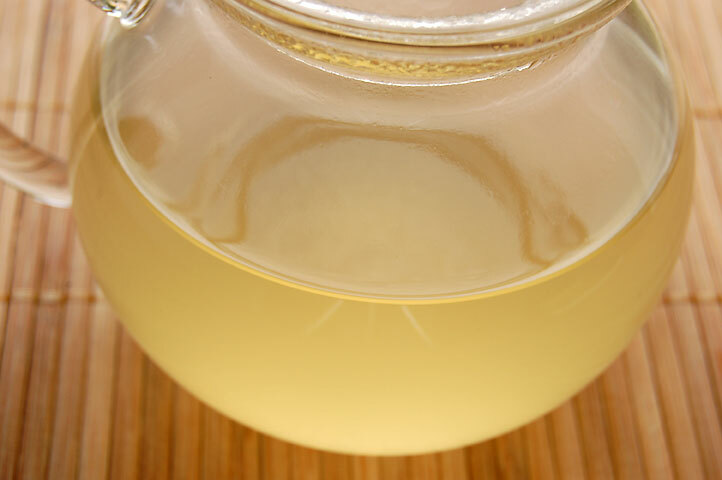 Ginger “tea” is often used to soothe nausea and motion sickness. I am enjoying it for its delicious flavor. Ginger has a distinctive warming quality to it, making it perfect for sipping on a cold winter’s day. That said, its warmth also has a refreshing quality that is cooling me down on this hot, muggy morning. Try adding a splash of infused ginger to your next glass of iced tea and spice it up!